Using aloe vera on the hair cleanses and conditions the scalp, helps balance the pH of the scalp, reduces oiliness, moisturizes dry hair and helps repair damaged hair. In addition, the gel from aloe's leaves can even stimulate hair growth in some cases, or at the least, prevent further balding. Maintaining and balancing the pH of the scalp is one of the known aloe vera uses. Sabila (aloe), also reduces oiliness, it moisturizes dry hair, and it even aids in repairing damaged hair due to hair styling and/or coloring. Aloe gel, derived from fresh aloe leaves can also be used to promote hair growth and also prevent hair loss. 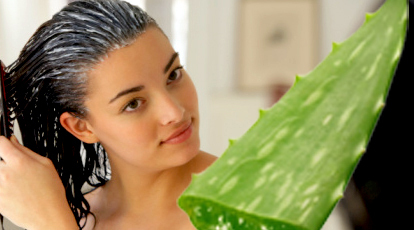 Most of us know that aloe vera is excellent for treatment of minor cuts and scrapes, burns and also sunburn. It is used in all kinds of cosmetics. But aloe vera is more powerful for external and internal use than most believe. So always keep a small bottle of aloe vera juice and add an ounce to two to your juice drinks. As a matter of fact, an aloe vera shampoo will also be able to cure various types of hair that people have; first of all, those with damaged and dry hair will be please to know that this particular type of shampoo will be able to take care of it. Treatment of hair loss with aloe vera or aloe vera products should be applied twice a day over a three month period, preferably on clean, dry hair. The medication should be applied all the way to the root of the hair. After three months of regular usage, using it once a day would be enough for it to take maximum effects. Aloe is the best way to grow long hair fast, for that reason it is usually found in all conditioners and shampoos, However the problem is that the herbal extract found in such products tends to be weak and may not be able to do any work whatsoever so always find the purest and most natural form of the plant.